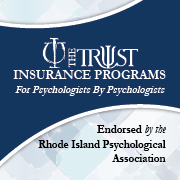 Welcome to the home of Rhode Island's Psychologists! The Rhode Island Psychological Association is the state association affiliated with the American Psychological Association. We are here to help members of the profession and the public. We have many member benefits! Please share your ideas about other member benefits we might offer. Mission Statement: The Rhode Island Psychological Association shall endeavor to promote the general welfare and well-being of individuals, families, groups, and society as a whole. Toward this goal, the organization strives to promote research in all areas of psychology, advance the education, training, and professional development of psychologists, to assure the highest standards of ethics, conduct, achievement, and skill, develop and promote the application of scientifically based psychological principles, provide resources to the public for information and referral for mental health services, present a strong voice for legislative and regulatory mental health advocacy, participate with other professional and community groups who share advocacy goals, provide services to the community of psychologists in Rhode Island, and advance the education, training, and professional development of psychologists to serve the growing culturally and linguistically diverse population of our state.